Do bed bugs cause harm or spread disease-causing germs? How can I tell if bed bugs are present? What should you do if there's an infestation? What should you NOT do if there's an infestation? What insecticides and other methods exist for treating bed bugs? What should you do when returning from a visit to an infested hotel, motel or residence? Can bedding encasement systems deter or end bed bug infestations? Bed bugs (Cimex lectularius, of the family Cimicidae) are small wingless insects that feed on the blood of warm-blooded animals. Bed bugs and their relatives have evolved as nest parasites, and have adapted well to living in people's homes. A bed bug can develop from an egg to and adult in as little as a month, while a single female bug can produce 200-500 eggs in her lifetime. Hatchling (nymph) bed bugs are no larger than a poppy seed; adults are about a quarter inch long. They are oval and flat-bodied before feeding, and their color ranges from off-white or tan just after molting, to a deep brown or burnt orange as a mature bug. The host's blood may appear as a dark red or black mass within the bug's body, and after feeding the bug becomes rounder and darker. Adult bed bugs can survive approximately a year without feeding; immature bed bugs (nymphs) can go 3-4 months without feeding. Bed bugs are nocturnal, lured from their hiding spots at night by the warmth of our bodies and carbon dioxide in our breath as we sleep. Bed bugs became relatively scarce during the latter part of the 20th century, but have resurged in recent years, particularly in North America, Europe, and Australia. They are most abundant in rooms where people sleep, and they generally hide near the bed or other furniture used for sleeping. Bed bugs are most active in the middle of the night, but when hungry, they will venture out during the day to seek a host. Their flattened bodies allow them to hide in cracks and crevices. Bed bugs have no wings and cannot fly, so they scatter when disturbed, seeking shelter in dark places. Favored hiding sites include the bed frame, mattress and box spring. A cluttered room offers additional sites for bed bugs to hide, and makes it harder to eliminate them once they have become established. Although most often found in bedrooms, bed bugs can also be found in living rooms and other places where people spend a lot of time. The most common shelters for bed bugs are in the seams of mattresses, in crevices in the bed frame, behind furniture surrounding the bed (especially the headboard) or where the wall meets the floor. Bed bugs seek out people and animals, generally at night, and painlessly sip a few drops of blood while the host is asleep. While doing so, the bugs inject a tiny amount of their saliva into the skin. Repeated exposures cause people to become sensitized to the bugs' saliva, so additional bites result in mild to intense allergic responses, usually involving skin lesions. The skin lesions caused by the bite of a bed bug resemble those caused by other blood-feeding insects, such as mosquitoes and fleas. It's usually not possible to identify which insect caused the bites simply by their appearance. A physician should be consulted to rule out other causes for the lesions and to offer treatment, as needed. Resist the urge to scratch the bites, as this may worsen the irritation and itching, or lead to infection. Physicians often treat patients with antihistamines and corticosteroids to reduce allergic reactions and inflammation. 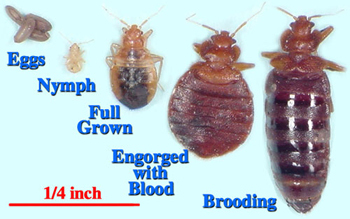 The good news is that bed bugs are not known to transmit any germs or pathogens. Their bites should be promptly treated, however, to mitigate the allergic response and prevent infection from other sources. Adhesive-based traps used for sampling insects or rodents are not very effective for trapping and detecting bed bugs. You must search for their signs! Carefully inspect your bed frames, mattresses and other furniture. Folds and creases in the bed linens, and seams and tufts of mattresses and box springs, in particular, may harbor bed bugs and their eggs. They may also be found within pleats of curtains, beneath loose areas of wallpaper near the bed, in corners of desks and dressers, within spaces of wicker furniture, behind cove molding, and in laundry or other items on the floor or around the room. A more established infestation is associated with dark or black staining of the mattress, bed linens or walls near the bed from bed bug excrement, and some reports suggest that an established bed bug infestation will also be associated with an unpleasant, coriander-like odor. Small droplets of blood on the sheets may also indicate the presence of bed bugs. Although dead bed bugs, cast-off bug skins and blood spots may indicate an infestation occurred previously, they do not confirm that an infestation is still active. So, if you find cast skins, inspect carefully for live crawling bed bugs. Because many other kinds of small brown bugs may be discovered, it is important to correctly identify them! Of course, the most typical way of discovering a bed bug infestation is to be bitten by them. Bed bug bites are unlikely to wake the victim; they can occur anywhere on the body but are often close to blood vessels near the skin. Bed bugs are great stowaways. Because they can hide in small crevices, they travel with luggage, furniture, clothing, pillows, boxes, and other such objects, especially when these are moved between apartments, homes and hotels. Used furniture, particularly bed frames and mattresses, are at greatest risk of harboring bed bugs and their eggs. Carefully scrutinize and consider the history of any used furniture, particularly yard sale items or used bedding sold in student areas at the beginning and end of the academic year. Because they survive for many months without feeding, bed bugs may already be present in apparently vacant and cleaned apartments. What's more, they can easily wander between adjoining apartments through the same holes and channels in walls though which wires and pipes pass. It is also possible for bats or birds to introduce and maintain bed bug colonies, so if you have bats or birds removed from your home, it may be necessary to make sure that bed bugs, other blood-feeding insects, or mites have not been left behind! What should you do if you think there's an infestation? 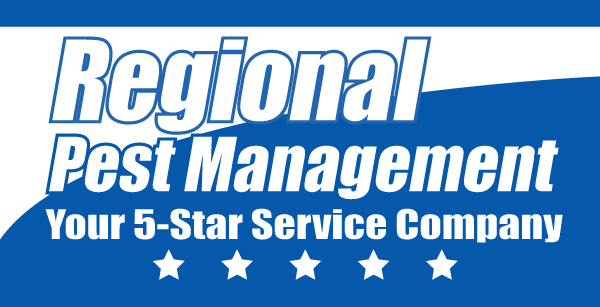 The first thing you should do is call Regional Pest Management at 1-800-36-5-STAR. Our expert technicians can help determine if your suspicions are true. 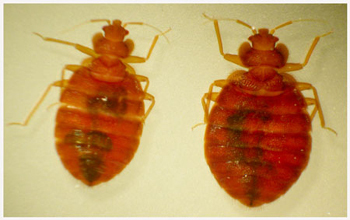 Because several different kinds of insects resemble bed bugs, specimens must be carefully examined. Once bed bug infestation is confirmed, Regional Pest Management will give you a written integrated pest management (IPM) plan that details the methods and insecticides to be used, and that will eliminate the bed bugs in a manner that promotes success while limiting unnecessary costs and exposure to insecticides. Although each IPM is specialized to its location, in general, managing bed bugs requires a multi-faceted approach that generally includes cleaning, room modifications, and insecticidal treatments. For instance, you should reduce clutter to limit hiding places for bed bugs. Then, thoroughly clean the infested rooms as well as others in the residence. Scrub infested surfaces with a stiff brush to dislodge eggs, and use a powerful vacuum to remove bed bugs from cracks and crevices. Dismantling bed frames will expose additional bug hiding sites. Remove drawers from desks and dressers and turn furniture over, if possible, to inspect and clean all hiding spots. Mattresses and box springs can be permanently encased within special mattress bags, which Regional Pest Management can supply (see below). Any bugs trapped within these sealed bags will eventually die. To prevent bed bugs from crawling onto a bed, pull the bed frame away from the wall, tuck sheets and blankets so they do not touch the floor, and place the frame legs into dishes or cups of mineral oil. Caulk and seal all holes where pipes and wires penetrate walls and floor, and fill cracks around baseboards and cove moldings to further reduce harborages. Because bed bugs and other pests may spread through cracks and holes in the walls, ceilings and floors, it is wise to inspect adjoining rooms on the same floor as well as those directly above and below. First and foremost, don't panic! Although bed bugs can be annoying, they can be battled safely and successfully if you adopt a well-considered strategy with the help of the professionals from Regional Pest Management. Do not apply pesticides yourself! Remember, you are legally liable if you misapply a pesticide, or apply it without a license to the property of another (including common spaces in apartment buildings). Generally, landlords, owners and building managers cannot legally apply pesticides. That's why hiring Regional Pest Management, a licensed pest control operator, to confirm the infestation and to develop an integrated pest management plan, is always the best course. You do not even need to dispose of infested furniture—it can be cleaned and treated. Placing infested furniture (particularly mattresses) into common areas or on the street may simply spread bed bugs to other people's homes. So don't discard furniture and don't treat the problem yourself—instead, call Regional Pest Management and get a plan! Dry insecticidal dusts, which abrade the insect's outer waxy coat and cause the bugs to dry out and die, are applied in cracks and crevices, as well as within the hollow interior of a tubular bed frame. Contact insecticides, which kill the bugs shortly after they come into direct contact with the product or its residue, are now available in products that do not repel bugs (thus making it more likely that they will come into contact with the insecticide, and die) and are effective for a longer period. Insect Growth Regulators (IGR) affect the development and reproduction of insects, but do not kill bugs quickly. These products are used as a supplement to other kinds of insecticides. 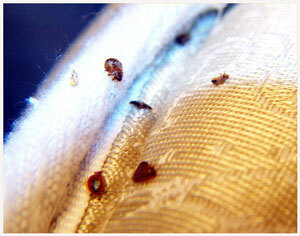 Travelers increasingly encounter bed bugs during their stays away from home. If you noticed signs of bed bugs, you may have unwittingly carried them or their eggs home in your luggage and other personal effects. Clothing should be laundered in a manner to kill bugs and their eggs before or as soon as these items are brought back into the home. Suitcases should be carefully inspected, scrubbed with a stiff brush, and thoroughly vacuumed. Heat can help; leaving luggage for several hours in a closed vehicle in full summer sun may render the items "bug free"! Yes. Cool, chemical-free, easy to use and comfortable to sleep on, modern bedding encasement systems as offered by Regional Pest Management are a proven winner in the fight against bed bugs. Installed properly, they can "crash" an infestation and seal it away from humans and pets. 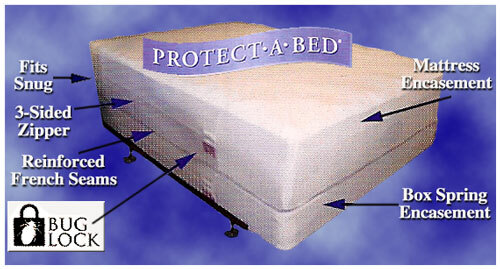 Regional Pest Management recommends the PROTECT-A-BED line of bedding encasement systems; for more information, click here for a 3-page brochure in PDF format, suitable for printing.